New, improved design - Now with two large thumbscrews! This high-quality Blue Fireball extension tube can be inserted into any 2" telescope focuser to gain an additional 35mm (1.38") of back-focus travel. With this, eyepieces and accessories that you may not have been able to use because your telescope tube was too short are usable again! Lack of sufficient back-focus travel is a common problem with many of today's fast f-ratio telescopes, especially if you have a low profile focuser or a short telescope tube that is optimized for binoviewer viewing. The 35mm extension tube alleviates this problem. This tube can also be used with 1.25" accessories with the use of commonly available 1.25"-2" adapters (sold separately). This practical and superb quality adapter is made from precision machined aluminum and is black anodized. It includes a brass compression ring that clamps around the inserted eyepiece or accessory. Because the set-screw does not come in direct contact with your eyepiece or diagonal, their barrel will not be scratched or dented. The inside surface of this tube is black-matted to enhance contrast by reducing stray light reflections and is threaded to accept standard 2" telescope filters. 2" barrel is smooth-sided. Total length = 70mm (2.76"), Extension provided = 35mm (1.38"), Weight = 3.6 oz. 4.8 (Based on 92 Reviews) 99% of reviewers recommended this product. Very impressed by these "Blue Fireball" brand extensions. Their form, fit, and finish are excellent, and they function as expected. 5-Star products. As is AgenaAstro! I've ordered different lengths and twist locks as well. Nice construction and I prefer having the double set screw for extra safety with heavier accessories. Very good service. Product as per described. 5.0 Very well made and reasonable! I needed the Blue Fireball 2" Eyepiece Extension Tube with 35mm extension when I changed focusers on my C80ED. It fit like a glove and does the job perfectly. It is a very well made product, but doesn't cost a small fortune. This arrived in excellent condition. It was perfect for my needs and is well made. most mak-newts are really designed for imaging - the focuser does not have enough out-travel for many eyepieces, especially 2” eyepieces. If your mak-newt did not come with a focus tube extender, this one is just what you need. Nicely milled, works as intended. Not much to say other than this worked well to establish the correct focal length to support the change from a 1.25" to 2" focuser in my Astroview 6 OTA. I use it to achieve focus with a 2" EP in a Crayford focuser on a f/6 dobsonian. Works great. Quality construction and finish. I wish BFB made one with 20-25mm extension as well. Lightweight, nicely machined, dual compression fitting screws - all positives. Looks like the build is good. Price was reasonable and it will allow me to use my DSLR with my Astrotech 72ED. What can I say, it's a 2" tube, well made, looks good, works without issue. Review by 2Big2Tall of Nottingham, NH. The Blue Fireball 80 mm. extension tube replaced three shorter extension tubes I'd been using. This was necessary for imaging with a DSLR camera body and a 2X power tele-extender lens. Now I only have one connection to worry about, and the two thumbscrews are a big advantage. Review by Jake of San Jose. Some cameras like my Sony Alpha 6000 need an extension tube to get prime focus. The length of the extension tube depends on the focal length of the telescope and camera combination. The fact that the Fireball Extension Tube comes in 3 lengths if very helpful. There are two large thumbscrews and a brass compression ring that won't make screw marks on you camera adapter. This is a quality product that's much better than the last one I had. Review by Bob of Canada. Review by Boaty of Fort Worth, TX. It has one job to do and it does it well. Review by DF of Troy Alabama. I use this extension tube to position my eyepieces and imagers. I like the brass ring that protects the mating parts and the thumbscrews fasten securely so I don't lose my expensive eyepieces. Review by Astro Bill of Wisconsin. This extension allows to acheieve focus easier. I can now focus with the camera firmly secured in the focuser. Makes taking astro photos much easier. This accesory was money well spent. I use this with certain eyepieces and cameras to extend focus mechanism. Review by Star gazer Dave. of Canada. Review by Therodir of Ontario, Canada. I bought this extension tube as I needed more back focus in order to use a focal extender I had purchased. I had a 40mm Blue Fireball I had previously used but it was unable to provide enough back focus. This 80mm extension tube did the job well. The tube is completely black with threads to accept filters or other accessories. It has a compression ring that is tightened with two screws that uniformly tighten to any accessory inserted into the tube without the problem of leaving screw marks. I would definitely recommend any Blue Fireball extension tube. Review by vaidya of Australia. Very high quality extension tube with brass clamp at a very reasonable price. Review by Anthony of Port Chester, NY. I use this in my 10'' dob reflector to gain more inward focus travel. Works great. Agena has great products and service. Review by Stubblejumper of Vancouver BC. Use as an extension for a refractor for astrophotography. Review by Seldom of Cedar City, UT. 5.0 Great accessory for an "IS" scope. 80mm Blue Fireball adds JUST enough focal length to focus a Canon 60DA with an TeleVue NP101is. Review by Fred of Indiana. I purchased the Blue Fireball 80mm extension to use with my Williams Optics 90 mm Megrez telescope when doing astrophotography with my SBIG 8300C camera. The 80mm extension provided the exact amount of extension to achieve focus with the SBIG 8300C when not using the OAG or filter wheel. The dual set screws and brass clamping ring result in secure attachment of the camera to the scope. I am very pleased with this accessory. Review by greggm of Lyman, WY. Excellent construction. Great fit and finish. Review by Rand of Mendon Massachusetts. I bought this after taking delivery of a William Optics ZenithStar 71 ED refractor and discovering that it would not come to focus with a DSLR camera attached. They assume you will use a 2" star diagonal with eyepieces, which generally takes up about 80 mm of back focus. Live and learn. In any case, this well - made extension tube worked like a charm to bring my camera to focus. Review by Rick of Nottingham, UK. Made the use of my Quantum 6 telescope perfect! Review by John J. of South Dakota. Well made and worked perfect for back focus for my camera to the focuser. I needed to focus on close (30 yds.) objects needing to extend the focus mechanism. This extension tube is perfect. It has a brass tightening band inside tube where eye piece fits. It keeps tension screws from damaging tubes. Fit and finish is perfect. Plastic caps for both ends of tube. 1.25 adapter ring is excellent fit and finish. **** Oh, and don't forget Agena customer service. I ordered at 11:15PM on a Saturday night and the unit was delivered (by US MAIL) on Monday morning @ 10:30AM! That's the best delivery service I've EVER had, close to what my pizza man does on his worst day. Review by Lowjiber of Las Vegas, Nevada. 5.0 High Quality at a Good Price! I have several telescopes and a wide variety of eyepieces. Often, a longer focal length eyepiece will need extra focal travel to achieve a perfect focus. I always add a 35mm extension when building up the "business end". It keeps me from fooling around in the dark when I decide to go with less magnification and a wider FOV eyepiece. These Blue Fireball extensions are very well built and serve the function very well. Nicely machined with large thumbscrews, they are a pleasure to install and use. Review by Phxbird of Espanola, NM. 5.0 A lot of quality for the money. I needed an extension for my 6" refractor. This 2" extension does a terrific job for the price! Very fine quality extension tube with much appreciated brass compression ring. Only improvement I would make would be to add another clamp screw to perfectly center the ocular. Review by Victor of Brazil. Great, low price for great use!! Review by Greg of Clifton Park, NY. Review by Jim of South Miami, FL. 5.0 A must-have for expensive eyepieces! A much needed accessory for using expensive eyepieces or diagonal in telescopes not offering brass compression rings. Review by Stargeezer of Nottingham, NH. This extension tube was needed because I made an innocent error in calculating the position of the focal plane when I was designing my Newtonian reflector. It was easier to add a small amount of back focus with the extension tube than to reposition either mirror. This extension tube is nicely finished with a compression ring and large thumbscrew to grip typically heavy wide-angle 2" eyepieces. Review by Ion Eyes of Bay Area, CA. Actually purchased this to use as a 2" filter holder in the optical train, and it works very well for that. It even has a brass compression ring to protect your eyepieces/ equipment. All parts are finely machined and well finished for excellent precision and function. One of the rare great values in astro equipment, well worth every penny. Review by charlie of Portland, OR. I purchased this extension tube for my new 80mm Lunt ED refractor to use on top of my C-14. I am using 20mm to 40 mm 2" eyepieces to include the 30mm ES 82 degree, 20mm ES 100 and 40mm MK-70. The Blue Fireball Extension is of high quality black anodized construction (inside and out) with brass compression ring and two finger screws for tightening. The extension tube is machined well and holds well in the focuser and the oculars hold well in the extension. I would highly recommend this unit as it fulfills its purpose very well. Review by God's Glory Observatory of Germantown, New York. Nice extension. Fast delivery and as usual no complaints with Agena. When looking for a product for my Astronomy needs I normally check to see if Agena stocks it. They are very competitive with their prices, and I know if I have any problems,They don't give you the run around, they do their best to resolve the issue. Review by Ken47 of Altamonte Springs, FL. 5.0 Just what I needed. I changed the focuser on my C6 telescope and needed this extension tube for focus. Review by jcs of 45* N.
Review by Merrill of Albany, LA. This one of the few extension tubes I've seen that has all of the best features big-name competitors have in one item, such as light weight, rugged build, brass compression ring, and stepped mounting tube. It has a second optional set screw, which is a nice touch. It helps to center the eyepiece and further prevents marring the tube. The price is competitive, being much lower than many competitors. My Orion XT10 did not have sufficient back travel for a number of my 2" eyepieces. The 35mm extension adds just enough distance so I can use my 13mm, 8mm, and 4.7 wide angles in 2" mode. Review by rpineau of Kensington, CA. The Fireball 2" extension is perfect when you need more back focus for your CCD camera on DSLR. Simple to use (you just slide it in your focuser) and robust. There is no slippage or play and it will old even the heaviest camera out there. Review by Bill of Missoula, Montana. Great addition to the GSO focuser. Made my Skywatcher 6" refractor into a first class instrument. Review by Phil of Seattle. I use both the 35 and 50mm extension tubes with my refractors which are very useful when using EPs that require substantial backfocus (eg Vixen LVWs). Using the extensions provides the ability to focus on very close-up terrestrial targets that would otherwise be too close to obtain focus without the extension. And having the brass compression ring puts them in with higher end ewuipment. Review by starstruck of Iowa. This tube has two set screws that tighten down against the brass compression ring inside which gives added security to your eyepiece or diagonal. I only wish it had a rubber grip strip,then it would be perfect! Review by JMB of Clarksburg, NJ. This is a beautifully machined piece of hardware. The no mar eyepiece holding, and the quality of finish make this a great value. The 35mm was just the ticket,for making my Meade 56mm parfocal with the Celestron Ultima LX series. Review by Tigerio of Uvalde, Texas. Review by sjwaame of Roermond, NL. 5.0 When I need more I'll be Back! Easy to use, straight forward and good length for getting scope into focus. Review by pjwdesigngm of Sterling Heights, MI. 5.0 Great Extension for 2"
Purchased this extender to gain backfocus with the GSO 2" focuser purchased from Agena, which I installed on an 80mm Bosma scope. The new focuser works very well and the extension is useful when imaging! Thanks Agena Astro for Quality and Value! Review by pat of Lake Stevens, WA. Review by TNUT55 of Missouri City, TX. I was very impressed by the quality of this extension. It's robust construction makes it one component that I don't worry about in the focusing train of my homebuilt cassegrain telescopes. Review by lynx79 of Ciechanow, Poland. It's very useful thing when you've got a short focuser. Clamping ring doesn't scratch Your eyepiece. Review by Rafcediel of Madrid, Spain. Review by Brad of Phoenix, AZ. Was looking for an extension to bring my DSLR to focus from a 2 inch focuser. Very good build quality and not to heavy. Very stout with no sag at all. I especially like the dual set screws that really locks it in place. Review by Andromeda59 of Brooklyn, NY. 5.0 Blue Fireball To The Rescue! I needed some extra focus travel for my 2 inch Orion 40mm Ultra Scan EP, when using it with my new XT8i Dobsonian scope. The Blue Fireball came on a high recommendation from a friend, so I tried it. The fit is excellent, and it really solved the problem. Review by Astronomicus of Florida. Review by Danno of Ontario, Canada. Light weight and well made with tight tolerances, the only suggestion for improvement is to make the thumbscrew a larger diameter keeping it low profile. That would make it easier to secure eyepieces more securely. Review by DB of Alabama. This a great solid extension tube. Some 2" eyepieces will not focus in my 8 inch dob. This extension fits the bill perfectly. The only complaint is the set screw is very small. Other than that I am pleased with the product. Review by Mitch of Canada, Ontario. Review by pablopox2008 of Buenos Aires Argentina. Review by VideoVic of Austin, TX. A necessity for astro imaging when not using a star diagonal on most refractors. Handy to have in your kit at star parties, too! Would love to see one with 3 thumb screws, for use with heavy gear. Review by EuropaWill of Warwick, NY. The unit itself is solid aluminum with great black anodizing. The compression ring holder and recessed saftey groove in the barrel were both requirements for me. I deducted one star from my rating due to it only having one set screw for its compression ring holder instead of two which would have given me more confidence in securely holding some heavy accessories. Overall its a solid addition to my equipment arsenal. Review by Lord Beowulf of Cedar Park, TX. 4.0 Just what the doctor ordered! I needed an extension tube for my 8mm Ethos on my AT80LE ED80 scope, since it wouldn't come to focus without it. I also wanted some 2" extensions for my astrophotography setup to provide clearance for the camera cooler I'd added to my DSLR. These fit the bill at a great price. I really wanted the safety ring on the barrel as I'd had problems with adapters in the past where my camera fell off due to thumbscrews working loose. I also like the brass compression ring as opposed to the single point contact of a screw. The only thing I'd like to see on this that would make it better would be a second thumbscrew on the compression ring. Still, overall a great piece for the price. Review by Sky Captain of Seattle, Washington. 5.0 Great product, just what I needed! Great product. I have all three sizes (35-50-80mm) and love the construction and finish on these extensions. I don't particularly like the safety undercut on the nose piece, but for the average user this won't be a problem at all. The EP tightening knob is a nice size and comfortable to use even with gloves on. Review by Ram Beau of Upstate, NY. I needed an extension for a 2" focuser on a recently acquired 120mm f/8.3 refractor that had been shortened for use with binoviewers. The Blue Fireball was a perfect solution with tight tolerances and a brass compression ring. It is easily the equal of some much more expensive extension tubes. Review by Bob in Texas of Hurst, TX. 5.0 Good product for the price. I needed a bit more length for a sharp focus with my Meade 30mm Ultra Wide Angle lens on my 10" Orion dob. This is perfect. Fits snug fit in the focusing tube with no wobble and gives me the extra length I need. Review by Top Jimmy of Ottawa, ON. 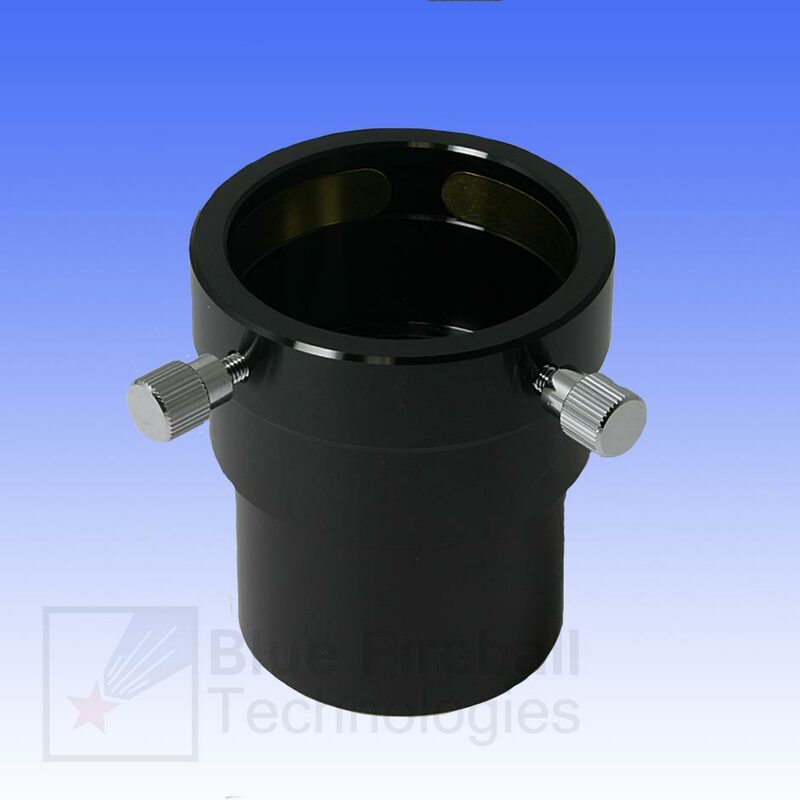 This adapter is made of precision machined aluminum with a black anodize finish. It has a brass compression sleeve, and threads on the inside to cut reflections. The threading also allows for attaching a 2" filter. It adds 35mm to the focus out distance, good for scopes meant for use with diagonals but you want to use in straight-through mode. My only suggestion would be to add a second thumbscrew to grip big 2" eyepieces a little more securely. Review by Scott the amateur astronomer of Greater Sacramento, CA. The only improvement I can think of is that the thumbscrew could be a bit larger. If it weren't for the fact that my 1.25" adapter is a helical compression type, which means that I twist a ring at top in order to clamp the 1.25" eyepiece, I don't think this wouldn't be an issue at all. It isn't that big of a deal but if the thumbscrew were bigger it would be easier to tighten down on the 1.25" adapter so it wouldn't twist in the extension barrel when I change 1.25" eyepieces. Review by Walter of ABQ. Added a Crayford focuser on my Skyview Pro 120 refractor. Needed a longer tube to focus it and found this online. It is a well made product at a very reasonable price. Review by thuemen-cm of Pembroke, Ontario. Canada. 5.0 A very handy item!! Provides that additional back focus, often needed. Eliminates the need for a diagonal when doing eyepiece projection imaging. This allows the imaging equipment to lined up straight through, minimizing balance problems and reducing rotational strain on clamp screws. The only negative... could use a larger thumb screw, but is slotted for use with a screw driver. Review by Astro Fred of West Georgia. 4.0 Excellent quality at a great price. I have a 16" f4.5 Newtonian reflector that I am using eyepieces requiring greater back-travel. This is a well made, solid and inexpensive solution. Who says you have to pay premium prices for quality accessories. Review by sdwest of Port Byron, IL. 5.0 Great product, great Company! With only days remaining until my 600 mile trip to the Nebraska Star Party, I found I needed a tube extension in order to reach focus with my new Crayford focuser. I was very pleasantly surprised by the high quality of the piece, it's light weight, and very smooth, quality finish. The cost was less than half of the cost of a similar item from some of the "big name" companies. Review by roryt of Athens, Greece. This is a well constructed and robust, long extension 2" tube. My only "complain" is that I would liked a slightly bigger thumb screw head, but nevertheless the tube does what it is supposed to do an it does it well. Review by Astro of Montreal, Canada. This extension is a perfect fit for my new GSO dual-speed focuser. It's nice to have a compression ring and know that it won't damage any of my eyepieces. On the other hand, an eyepiece with an undercut will get caught on the brass ring which can, at times, be annoying. Overall great product. Review by Steven of Columbus, Ohio. The 2" extension tube is a quality product. It is well machined and well finished. Review by Jose Mtanous of Monterrey, Mexico. This is a very good quality extender. I bought it for the price but I was surprise with the construction and finish quality. If you are into astrophotography keep a set of extenders handy. Review by Sandy of Lebanon, PA. The quality of this product was great. I use it when doing Astrophotography or observing. I have no negative things to say. Review by sdh1 of Texas. I bought this extension for use with the GSO Low Profile Crayford focuser. The low profile focuser is great for imaging, but is a little short for some eyepieces in my telescope. The 50mm extension fixes that problem. It allows all of my eyepieces to comfortably come into focus while using the low profile focuser. The 2" barrel fits into the focuser without excess play. The brass compression ring holds eyepieces in place adequately even though it only has one thumb screw. It has a safety groove cut into it to avoid falling out of the focuser. The extension tube is threaded for filters, but the 2" filter threads did not mate well with my Orion Skyglow filter (but can engage enough to be used). There are known issues with not everyone using the same threads for astronomical filters. The inside of the tube is black and machined with grooves to reduce reflected light. This item is of good quality and available at a much lower price than alternatives. Review by Chote of Bangkok, Thailand. I bought the extender for my Equinox 80ED because its focuser tube is too short for me to reach focus with my Canon 300D. The color and build really match my 80ED! The build quality is excellent, the weight is light. Before I placed my order, I was not sure about the product quality; but after buying the piece, it totally changes my mind. Review by John of Costa Mesa. I have Baader Hyperions and this adapter allows me to use the 2" section of EP and maintain perfect focus in my 10" Dob. I now can use 1 1/4"filters on EP and 2" filters on the extension without interference unlike with the other set-up. If you have used the 1 1/4" to hold this heavy eyepiece when you have a 2" focuser, feel more secure and get this adapter! Review by StargazerTony of Apple Valley, CA. I received my 35mm 2" extension. I opened the box and was pleasantly surprised at the quality of the piece. My main reason for purchasing the extension was the fact that I have a low profile GSO crayford focuser and in using my Hyperion 13mm eyepiece in the 2" format I didn't have enough outward travel to bring it to focus. The extension is very well made of all aluminum, and is extremely light as to not add much unnecessary weight to the eyepiece chain. The extension has a brass compression ring so it will not damage the barrel of my eyepieces and it holds them really snug. All in all for the price I am extremely happy with the look, feel and quality of this extension. For [$] it's a deal! I recommend the extensions to everyone in need of one!